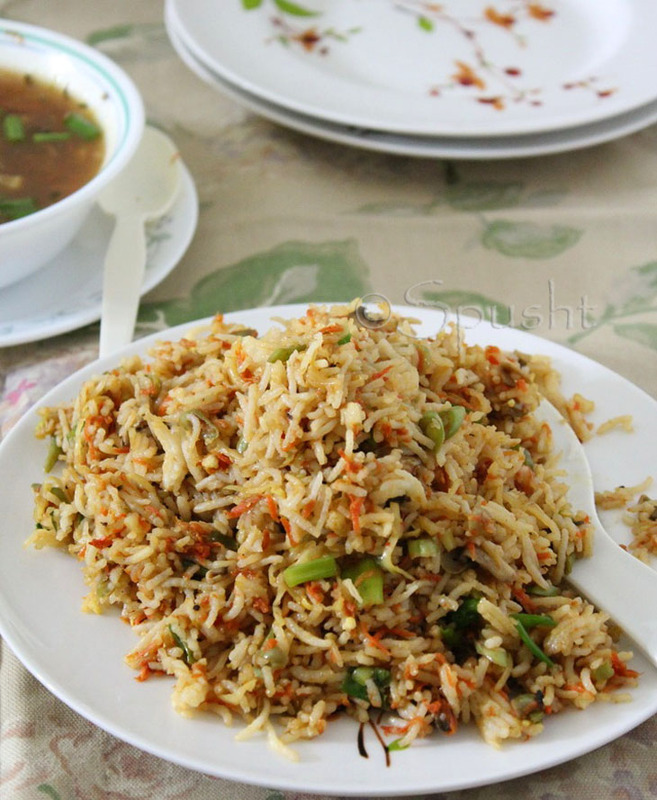 There are plenty of vegetarian options in Indo-Chinese cuisine, all the way from appetizer to main course. Gobi Manchurian? Check. Manchow Soup? Check. Chili Paneer? Check. 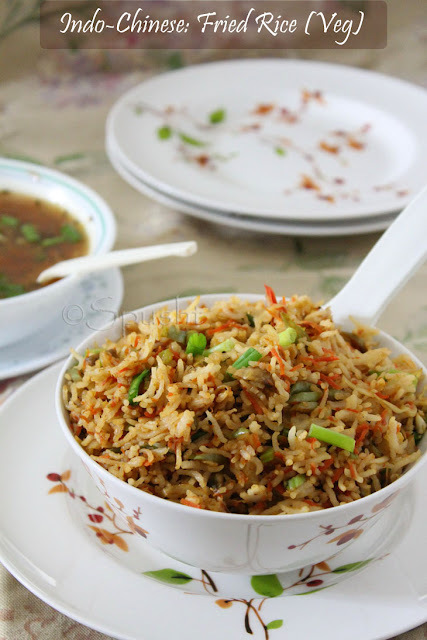 And especially after making other dishes that uses similar ingredients, whether vegetables or sauces, why not save some of each to cook up a Chinese Fried Rice instead of plain rice to go along with the meal? 1. Heat oil in pan; add spring onion whites + garlic + ginger + green chilies + celery & sauté on high flame for few seconds. 2. Add the chopped veggies & stir-fry till little tender. 3. Add all the remaining ingredients & mix gently, cook just about a minute & serve hot. * Boil, steam, or cook rice as you normally do, but just until about 90% – you don’t want mushy rice when adding to the vegetables because they’ll cook further with other ingredients anyway. Fluff the rice up with a fork & keep aside till it cools down, then use it to make Chinese Fried Rice, or for any fried rice dish for that matter. This can be just a yummy and simple one dish meal that is very good for whenever you have left over rice! Poetry: Mom - Happy Mother's Day! Fenugreek Leaves – Boon or Bane?